Just when you think you’ve got it all figured out, God throws you a curve ball. For nine years, Abner Rodriguez and his wife had been praying for a house. After only two months to settle into their new home, God revealed his plan to send the family to Del Rio, Texas, to plant a church. It would be Abner’s first church plant in the United States, though for a decade he’d been a highly successfully church planter and pastor of some two thousand people spread out among twenty sites in the Mexican border city of Piedras Negras. An inflatable bed hasn’t been the most comfortable sleeping arrangement, and the added commute between churches has been far from pleasant. Nevertheless, the blessing of being on the frontier of revival among our Hispanic brothers and sisters has been worth every mile and trial. At 24 years old, Abner Rodriguez planted the Church of God congregation in Piedras Negras, a bustling city of roughly 150,000, across the Rio Grande from Eagle Pass, Texas. Though the building they had wasn’t much to admire at first, it did offer space for up to about two hundred. “When your church reaches 60- to 80-percent capacity, you need to do one of three things,” Abner explains. “You need to add on with new construction; rent another, bigger facility; or go to two services.” Abner went with the third option. But two services quickly turned into three and, while considering how to add a fourth service to the weekend lineup, the leadership team began to express feelings of burnout. Abner sought his father for wisdom. Juan Rodriguez, a pastor and church planter in the Church of God for thirty-six years, identified one of the greatest hindrances to church growth: a lack of capable leaders. So Abner and the church in Piedras Negras decided to open a ministry training center and Bible institute. By faith, Abner believed he would soon have the leaders necessary to expand. Introduced to the concept of a multisite church, but facing technological limitations, the church chose to utilize newly developed leaders from the training center as onsite pastors at various locations across the city. Eleven years later, the ministry is bursting at the seams with twenty-one locations. Pastor Abner Rodriguez still serves as pastor at the primary location in Piedras Negras. He also oversees the ministries at the other sites. But heeding God’s call to plant a church in Del Rio, Texas, meant thinking outside the box—and outside of the country. Upon hearing news of the new ministry calling, his father informed him that nearly thirty years prior, he’d joined Church of God pastor-evangelist Luz Gonzales for prayer that God would someday send someone to plant a Spanish-speaking Church of God in Del Rio. What a confirmation of God’s will for Abner! 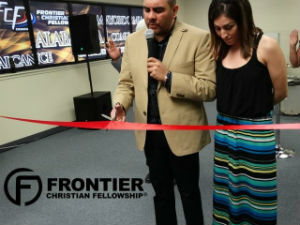 In the interest of reaching a segment of the population unwilling to rise early on Sundays—and to allow Abner to shepherd the Piedras Negras flock in the morning—Frontier Christian Fellowship began holding services at 4:00 on Sunday afternoon. Several hours a day spent on the road does little to discourage a pastor whose one-and-a-half-year-old church plant has already shot up to seventy in attendance. From the launch of Frontier Christian Fellowship to the present day, Abner has witnessed several miracles to which he gives God all the glory. A few years after receiving the call to plant a church in Del Rio, God opened a door to a facility. Seemingly out of the blue, Abner picked up the phone to hear from a business man in the community who asked if he was still looking for a place to rent. This man offered Abner his building at no cost! Just over a week later, Frontier Christian Fellowship held their first service. Only one problem: they had no sound equipment or musical instruments. But God knew what he was doing. First Church of God in Houston reached out to supply the church with musical instruments and sound equipment. Two weeks later, the instruments and sound equipment were stolen. Another setback! But again, God was in control. Not only was one of the church members generous enough to offer to pay for new equipment, but a local pawn shop contacted Pastor Abner with the news they’d recovered the equipment! “We were able to get back what hell had stolen!” he exclaims. Please continue to pray for the spiritual and physical health of Pastor Abner Rodriguez and the congregations in Del Rio and Piedras Negras. He asks that the Church of God pray that they would be able to secure a place to call their own as they grow out of their current facility. Thank you! This entry was posted in All Church of God, Central and tagged Abner Rodriguez, church growth, church planting, Del Rio, FCF, Frontier Christian Fellowship, Hispanic, Luz Gonzales, Mexico, Piedras Negras, Spanish, Texas. Bookmark the permalink.